8 Reasons You Should Be Using Peppermint Oil!!! Peppermint oil is one of my staple essential oils. It’s not only good for the hair but for my overall wellness. It is may favorite because it is very pleasing to all of the senses and has many benefits both externally and internally. There is so much versatility in its use because it is both calming soothing as well as stimulating and invigorating. There are so many amazing uses for this oil but I am just going to talk about the way that I use it for now! Aids in Digestion. 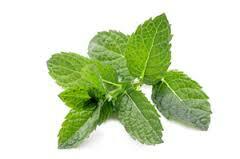 Peppermint helps calm the stomach muscles and allows food and bile to flow through and be broken down easier. It can be taken by methods such as peppermint tea or capsules. In a bind and can’t find those things? Try peppermint candy (beware of sugar) or using a peppermint toothpaste or mouthwash. Upset Stomach or Gas. Peppermint helps sooth the discomfort of these stomach pains by calming the stomach and abdominal muscles and giving a numbing effect to the nerve endings in that area. It also has some antibacterial properties that may help regulate any bacterial imbalance causing bloating, gas and discomfort. I recommend peppermint tea and capsules for internal use. For external use, mix peppermint oil with a carrier such as olive or jojoba and apply to the lower abdominal area. Scalp Care. I use peppermint in several of my cleanser recipes. More than anything, I simply adore the cool and tingly feeling my scalp has afterwards, especially because I usually cleanse before bed. It helps lullaby me right to sleep. The peppermint helps relax the muscles of the scalp and follicle in particular. This in combination with stimulation helps regulate sebum flow so there are less impurities lodged in the follicles. Regulated sebum flow also means more lubrication for scalp. I also use in deep conditioners or mix with a carrier oil and apply directly to the scalp. Hair Growth. Adding massage and manipulation when using this oil increases blood flow to the area even more. This added stimulation also encourages hair growth because the more nutrients delivered to the surface of the skin the more nutrients for the follicle to absorb to produce hair! I blend into my cleansers or mix with a carrier oil and massage directly into the scalp. Dandruff. Peppermint oil helps balance the pH of your scalp because it contains antifungal and antibacterial properties. It can kill some bacteria which can reduce the production of excess flakes. As stated above, this helps regulate your natural sebum flow which also contains anti-dandruff properties. I blend into my cleansers or mix with a carrier oil and massage directly into the scalp. Pain Relief. As I mentioned before, peppermint oil has numbing properties, so I use it for pain relief for everything from menstrual pains to headaches. It is great to use before and after styles that leave your scalp feeling sensitive or irritated due to manipulation. It is excellent when paired with lavender oil. Mix with carrier oil and apply directly to the scalp. Congestion Relief. When I am feeling congested I just simmer or steam some peppermint oil and take it in. I also like to mix with a carrier oil and apply on my chest as a rub. There are other oils that can be used in place of or in combination with these oils for increased benefit such as menthol and eucalyptus. Peppermint tea is a good alternative as well. Bug Repellent! I discovered this use when I was living in Savannah! Big spiders would spin webs right above my door and I would always get it tangled in my hair along with other scary things on a regular basis. I mixed several drops of peppermint oil with water and cooking oil in a spray bottle and sprayed it around my door. Problem solved!! Spiders do not like peppermint oil. The menthol irritates their senses. Hopefully, now, you understand why I always keep peppermint oil handy! Peppermint oil has many benefits but make sure it is safe for you and use in moderation! Some natural things aren’t the best option for everyone depending on allergies, age, and other preexisting medical conditions. How do you use peppermint oil? Thanks for stopping by! Author AphropuphsPosted on November 16, 2014 November 17, 2014 Categories Natural Living, Natural Products, Naturally BeautifulTags alopecia natural remedy, black natural hair, esential oils for natural hair, essential oils for hair, itchy scalp dandruf, peppermint oil for hair, peppermint uses, scalp care1 Comment on 8 Reasons You Should Be Using Peppermint Oil!! !